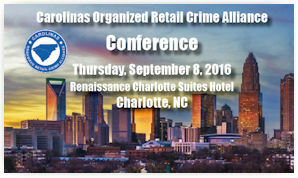 The Carolinas Organized Retail Crime Alliance (CORCA) will host its premier Annual Conference on September 8, 2016 in Charlotte, NC with a Welcome Reception on the evening of September 7. Formed in February 2016, CORCA is a partnership organized through the North Carolina Retail Merchants Association (NCRMA) and the South Carolina Retail Association (SCRA). CORCA is an Alliance of retail businesses and law enforcement agencies working to combat organized retail crime activity in the Carolinas, through the Retail Consumer Alliance Foundation. The CORCA Conference will bring together experts specializing in fields such as loss prevention, security, risk management and emergency management along with law enforcement, prosecutors and policy makers. This event will provide an opportunity to network, learn about the trends surrounding retail crime in the Carolinas, and connect with vendors on innovative products in the field today. A wide-range of topics will be covered throughout the day at both the general and breakout sessions. Presentations will be focused on some of the most pressing issues, such as organized retail crime, cybersecurity, return fraud, e-commerce, asset protection technology, and the private and public sector partnerships in the Carolinas. The incomparable exchange of knowledge will benefit retailers and law enforcement across the Carolinas. 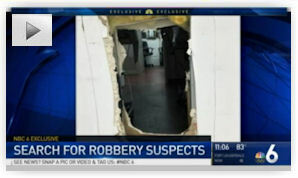 North and South Carolina are a hub for organized retail crime w ith major thoroughfares such as I-26, I-40, I-85 and I-95, running along the eastern corridor and right through the Carolinas. It is imperative that we work together to strengthen and expand this alliance, because together we can better identify organized retail theft networks and combat retail crime. We invite you to join us at the Annual Conference. We believe you will strongly benefit from the information-sharing, face-to-face networking and educational seminars. Online registration is open now. Early-bird registration ends August 12. Vendors and company supporters: We are currently scheduling seminars, meals and activities for the CORCA conference and welcome your sponsorship. Sponsorship packages and information are available here. For more information about this organization, contact Jessica Edwin, CORCA Program Manager, at jessicae@ncrma.org or visit www.CORCA.org.